Today, we fancy it up a bit. This No-Bake Pineapple Cream Pie begs to be made on days I miss the taste of summer. Or just about any day I need a refreshing break from cake or chocolate, which, yes, are few and far between. Feeling extra-festive (on this pretty fall day), I layered the pie in a wine glass and served it over Sunday lunch. It was a hit! 1. Beat cream cheese and sugar. Add pineapple chunks, walnuts, and cover with whipped cream (I say about 10 seconds worth). Mix until smooth. 2. In a Ziploc bag, crush graham crackers until reduced to crumbs. Tip: You can also use ready-made Graham cracker pie crusts (or Oreo crusts! YUM). Another tip: sprinkle some of the drained pineapple juice on the crust. 3. In a bowl or glass, layer cream and Graham cracker crumbs. 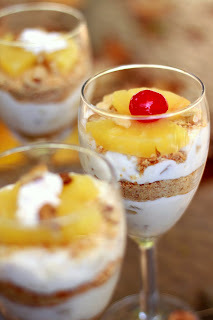 Garnish with pineapple chunks, walnuts, and whipped cream. Refrigerate for at least two hours. Ta-dah! Chocolate chips optional but recommended. I'm going to love your No Bake Mondays recipes. This one looks real fancy. Thanks for making the no bake mango fridge cake!It was delicious.